Ash Wednesday is the first day of Lent. This year it will occur on March 6, 2019. Ash Wednesday starts the Lenten season. It marks the first day of the 40 days of Lent, a roughly 6-week period (not including Sundays) dedicated to prayer, fasting and almsgiving in preparation for Easter. Believers receive ashes on their foreheads. The ashes come from palms that were burned from the previous Palm Sunday—the Sunday before Easter. Palm Sunday marks Jesus’ triumphal entry into Jerusalem, where people waved palm branches to celebrate his arrival. The ashes are typically mixed with holy water or oil. There is no rule about how long the ashes should be worn, but many people wear them throughout the day as a public expression of their faith. 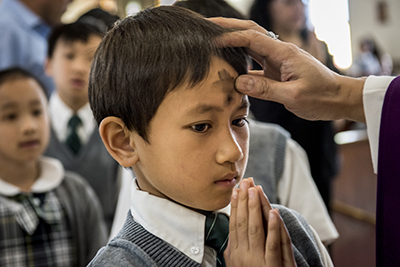 For Catholics, Ash Wednesday is not a holy day of obligation. Catholics abstain from meat on Ash Wednesday and Fridays during Lent. Here are some meatless recipes for this Lenten season. Catholics ages 18 to 59 also fast on Ash Wednesday. Fasting entails eating one regular-size meal and two small meals. How Can You Live Out Your Faith During Lent? CRS Rice Bowl is Catholic Relief Services’ Lenten faith-in-action program for families and faith communities. For more than 40 years, CRS Rice Bowl has inspired prayer, fasting and almsgiving across the U.S. and delivered hope to millions around the world. We invite you to join us this year and encounter Lent. Read the 2018 Lenten address from Pope Francis.